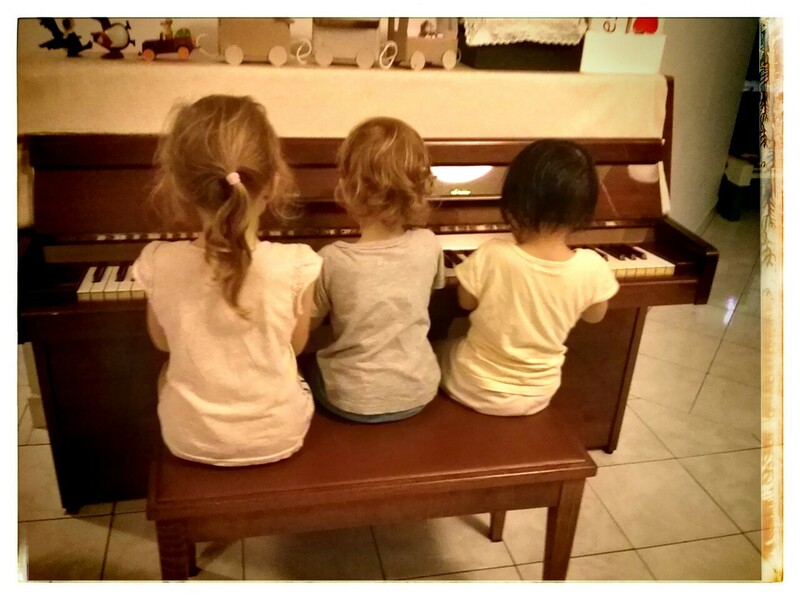 It is nice to have 3 child seated on the rectangle piano chair playing their melody… separately. The noise melody is nothing impressive but 2 mothers is happy to see them enjoying themselves. This is my old piano. I have it for almost 28 years. I left it for a good 20 years with my mother. I decided to ship it back with me after I deliver my lil girl. I think some early childhood music lesson will be nice for her. Just an early exposure, not the proper piano lesson. I am trying hard not to be like many parents who live in my city, who send their child to all kind of early exposure class like gym, ballet, early reader, left brain right brain development, toodler yoga class, art and drame, Shichida brain development, little artist class and etc. The choices is unlimited, and supported by many research, successful testimony, and big price tag. Many parents don’t want to miss out the golden brain development period of their child. They send their child from one class to another. It cost them up to 20k for a year or more, hoping from one class to another. Their child enjoy it and they can see improvement in their child development. I didn’t let my girl go for any of this. At one end, I worried my little will miss out among her peers later in life. But, another end…I think it is better to do things in moderation and I don’t have a 20k spare to spend for my child early education. So, I decided I can teach her many things on my own. I teach her drawing, coloring, craft, cooking, baking, swimming, dancing, singing and even basic music beat, piano do re mi. She also help me with laundry, sort clothes, pick up her toy, clean the table, mop the floor and rinsing the dishes. I don’t teach like a pro but I allow her to play and have fun. I don’t need her to do cooking for real but take joy she is able to identify the name of various vegetables and herbs. I don’t need her to play the right note when she sing her twinkle twinkle little star while playing the piano but I smile when she sing in the right tune and playing with the right beat. She don’t have a mother who take her to various interesting classes but she has a mother who play with her. I hope it is sufficient.